Nickelodeon, the number one producer of television animation in the world, has greenlit a new series from the creators of the hit animated TV show Avatar: The Last Airbender, it was announced today by Brown Johnson, President, Animation, Nickelodeon and MTVN Kids and Family Group. The new series The Legend of Korra (working title), from creators Michael DiMartino and Bryan Konietzko, will premiere on Nickelodeon in 2011, continuing the evolution of the animated franchise and its mythology. The original series was the inspiration for the Paramount Pictures and Nickelodeon Movies live-action epic adventure, The Last Airbender, which has already grossed more than $115 million at the box office to date. The Legend of Korra takes place 70 years after the events of Avatar: The Last Airbender and follows the adventures of the Avatar after Aang – a passionate, rebellious, and fearless teenaged girl from the Southern Water Tribe named Korra. With three of the four elements under her belt (Earth, Water, and Fire), Korra seeks to master the final element, Air. Her quest leads her to the epicenter of the modern "Avatar" world, Republic City – a metropolis that is fueled by steampunk technology. It is a virtual melting pot where benders and non-benders from all nations live and thrive. 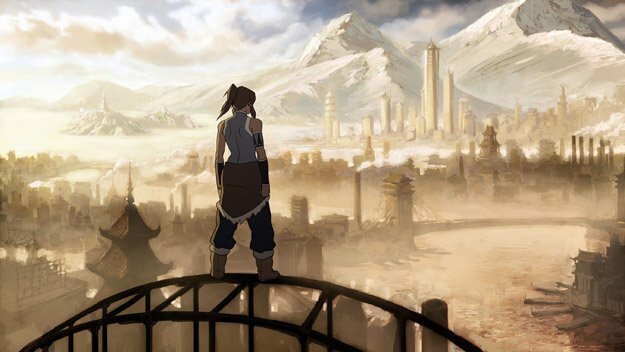 However, Korra discovers that Republic City is plagued by crime as well as a growing anti-bending revolution that threatens to rip it apart. Under the tutelage of Aang’s son, Tenzin, Korra begins her airbending training while dealing with the dangers at large.